Do you provide qualitative plumbing services and dream of bringing your business to the next level? Then an effective online presence is the very thing you need. If you’ve already realized this fact it’s high time to begin acting. Don’t you know where to start? Well, we’ll give you a hint. 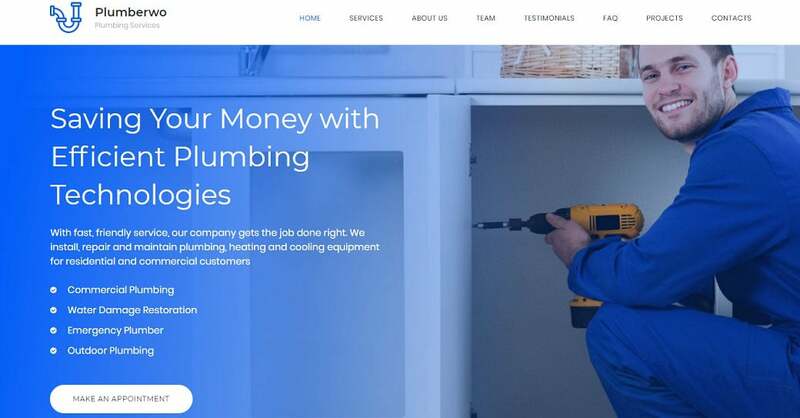 First and foremost, find a great plumbing website template that will become an initial step towards your online success. It goes without saying that not each and every template can guarantee a successful online start. Even those looking great may turn not the best solution if they lack the necessary functionality. Consequently, to make a right choice you should pay attention to several vital points. Firstly, focus on the responsiveness. There’s little use of a website if your clients can’t browse it seamlessly on any device. Secondly, make sure that you’ll be able to fill your future website with various kinds of content. There’s no doubt that you’ll have a desire to enliven it with different galleries and, maybe, video and audio. Thirdly, pay attention to the ease of customization. If you are a beginner, you surely don’t want the process of editing to become a nightmare. Next, concentrate on the opportunity to keep in touch with your online audience. This means that the template should provide you with blog functionality and useful tools for email marketing. Finally, take into consideration the level of customer support services. It’s quite possible that one day you’ll need a helping hand with some technical issues. 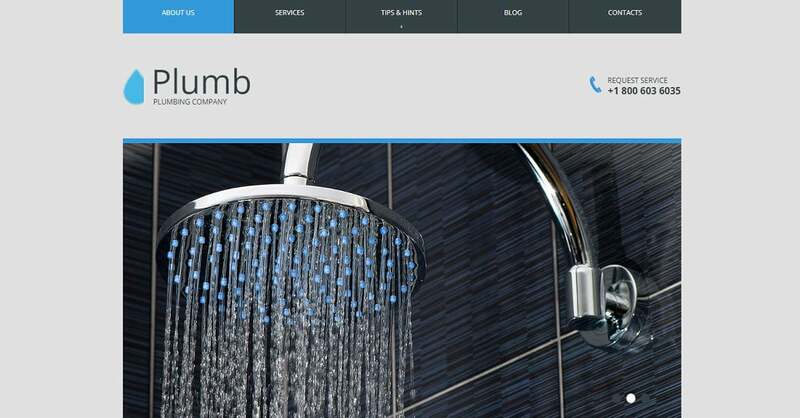 Of course, a wisely chosen plumbing website template is important. However, it’s just the first step. You’ll surely have to make some more to achieve the desired aim. To begin with, you should design the home page capable of grabbing your prospects’ attention at the first sight. As a rule, the first impression determines the further consumer behavior of your visitors. First and foremost, your home page should look appealing and highlight your brand individuality. 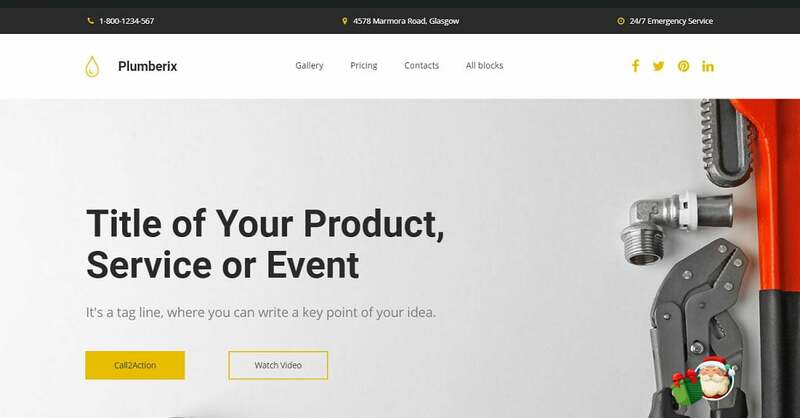 Use a hero image for catching attention and creating an unforgettable atmosphere of your website. Carefully think out a color scheme. 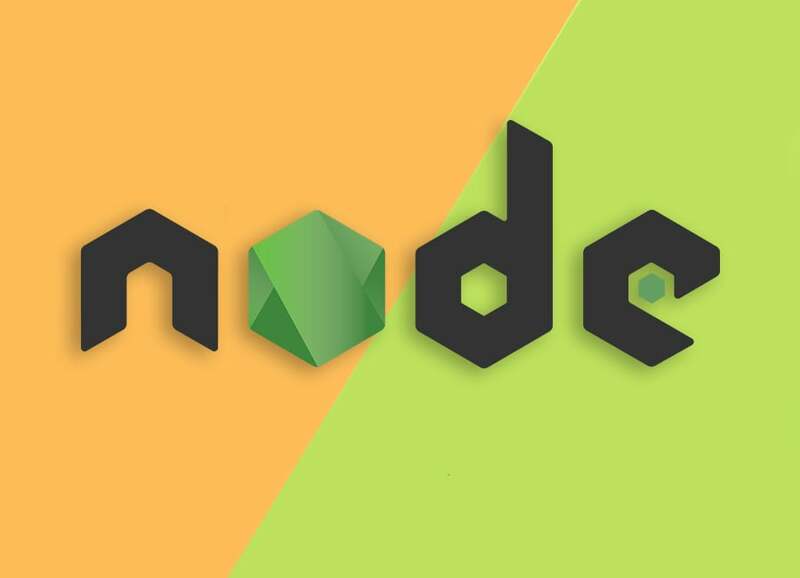 In fact, you need not more than 3 (maximum 4) colors. Choose one dominant color as your brand color. Then select one or two accent colors and a background one to complete your design. To acquire useful knowledge on the subject feel free to study our Color Combination Ultimate Guide. Next, your home page should clearly convey your message to the visitors. Ensure that such key elements as value proposition and call to action are visible without scrolling. What’s more, don’t forget to insert your contact information in the header or/and footer. It’s not a secret that the competition in the plumbing sphere is rather tough. According to the IBISWorld Statistics for October 2017, the USA had 117,776 plumbing businesses with 473,020 employees engaged in them. That’s why it’s vitally important to show people that your services deserve their attention. It’s a common knowledge that visuals are the best way of demonstrating your skill. So, use high-quality images to tell about your services. Also, it’s a good thing to implement one or two videos to keep your visitors engaged. As soon as your audience gets interested in your services they will surely want to find out who you are. An effective About Us Page is the best way to answer all their questions. While creating an About Us Page, never forget that its content and design are equally important elements. In other words, try to keep your About Us Page both attractive and informative. Remember that a good About Us Page should tell a single coherent story. Moreover, this story just can’t be boring if you want your visitors to read it to the end. Carefully organize the elements of the page to make the information easily digestible. Take care of readability by choosing a font that is easy to perceive: clear and of comfortable size. Let your About Us Page design reinforce your story and that’s it. The more emotional tie you manage to achieve, the greater is the possibility that prospects will turn into clients. One of the easiest ways to build such a tie is the photos of your company staff. Believe, they are a reliable source of increasing your brand recognition and trust. Frankly speaking, it doesn’t matter what kind of photos you’ll choose. Both face and full-length portraits may perform perfectly. The only thing to bear in mind is their high quality. Hardly will anyone deny that the best way to prove your professionalism is your clients’ testimonials. Undoubtedly, their effectiveness is much higher than that of your own words. 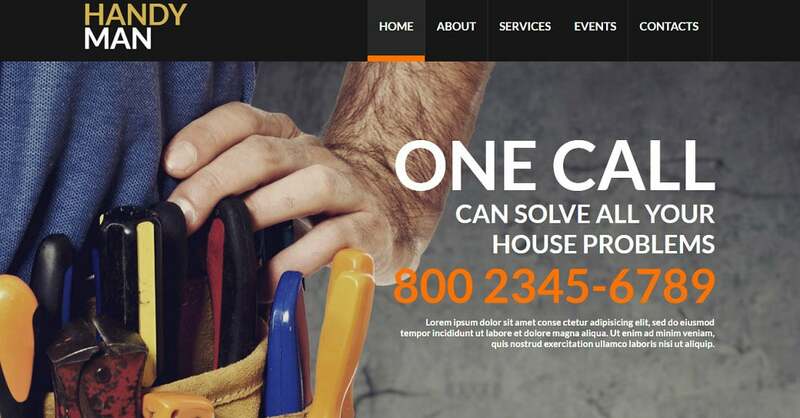 So, don’t hesitate to make them a part of your plumbing website design. While implementing testimonials, make sure that they are specific and something that people can rely on. Don’t forget to add your client’s name and a photo to increase the credibility. To tell the truth, there are thousands of plumbing templates on the web. So, it’s not surprising that a beginner may get lost among this variety. The worst thing is that quantity doesn’t mean quality. 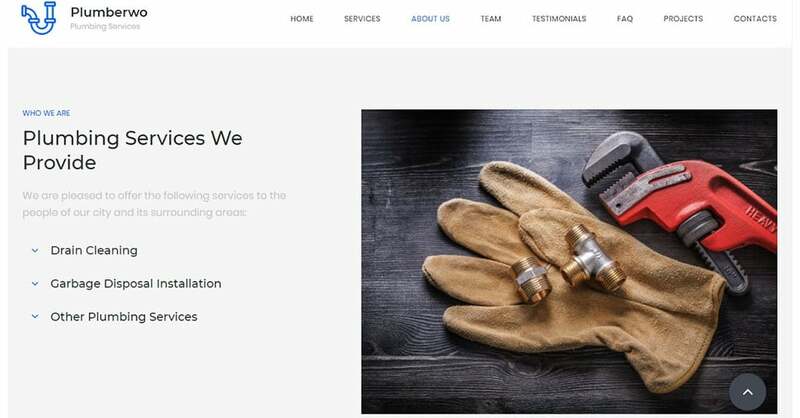 That’s why we decided to give you a helping hand and advise several plumbing website template designs capable of making your business shine online. 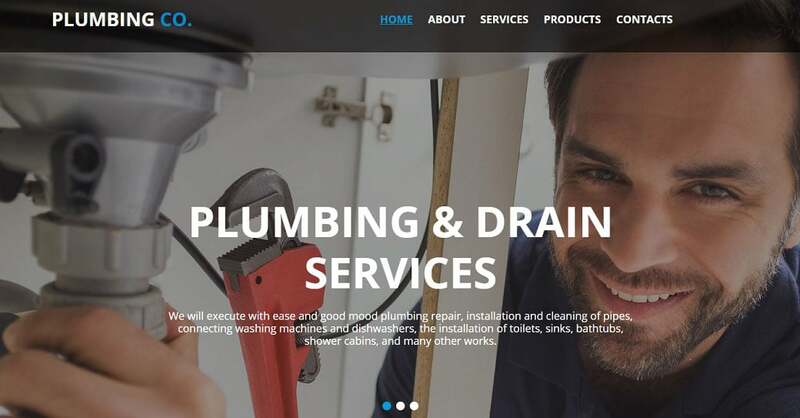 Plumberwo is a completely responsive plumbing website template with an eye-catching design and simple navigation. 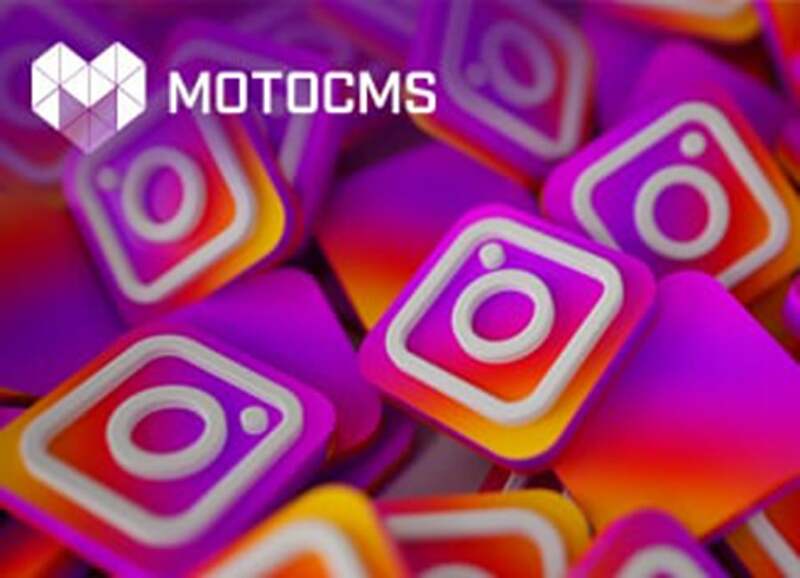 That’s why it occupies one of the leading positions among MotoCMS plumbing themes. The best thing is that you don’t need any tech skills to build a highly-functional website with Plumberwo. Just take your mouse and drag-and-drop any content element you wish on the layout. The user-friendly admin panel will provide you with all the necessary tools for customization. Besides, interactive text and video tutorials inside the admin panel will clear up every step of the website creation process. 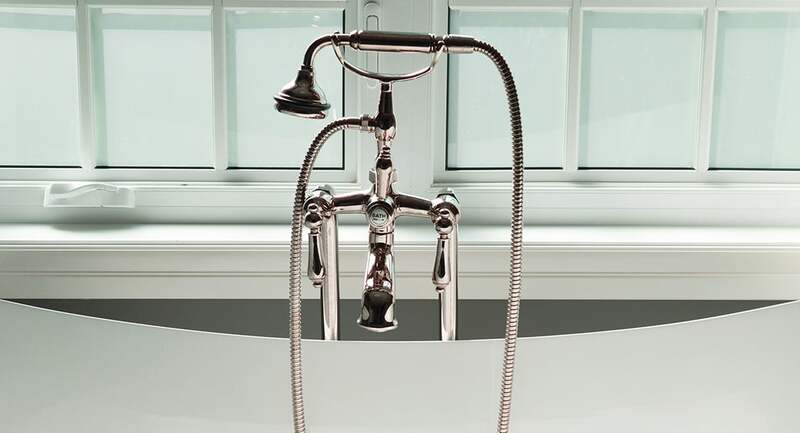 Whatever kind of plumbing services you provide Smith theme may become your number one choice. Firstly, it will take you less than 5 minutes to install the template. Secondly, several hours will be enough to fill it with the content using a convenient website creator. Thirdly, any imaginable functionality is not a problem due to the wide range of helpful widgets. 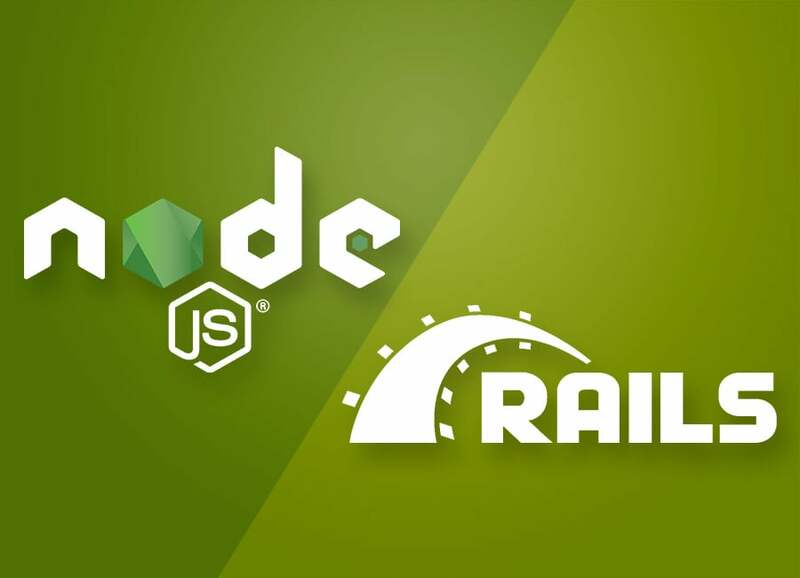 Finally, a lightning-fast loading speed and 24/7 professional customer support are guaranteed. Whether you are an individual engaged in plumbing business or represent a large plumbing company Plumber Pro deserves your attention. 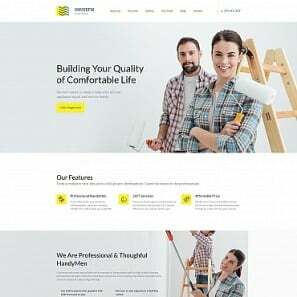 Frankly speaking, this responsive website template is a real bargain. 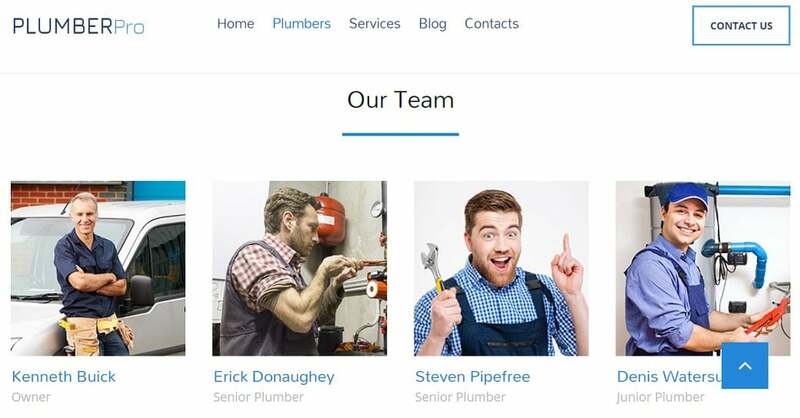 You won’t have to put much effort to launch an amazing plumbing website with it. Thanks to the numerous pre-made pages you’ll create your website in no time. Moreover, you’ll be able to update it on a regular basis with newly released features and functionality via one click. 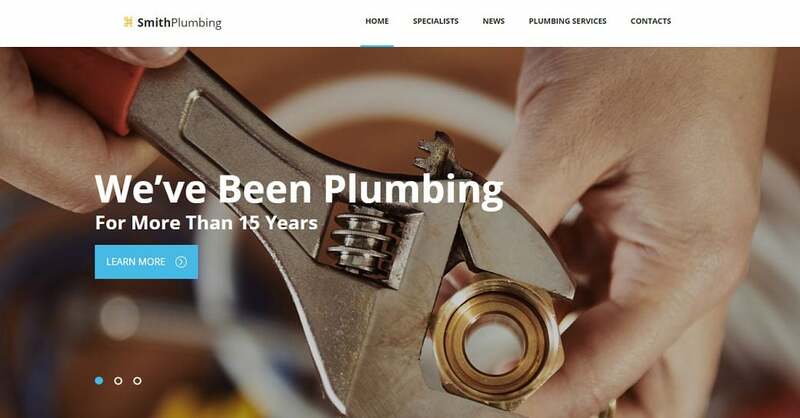 This plumbing website template is a smart choice to make your future website stand out among other websites for plumbers. 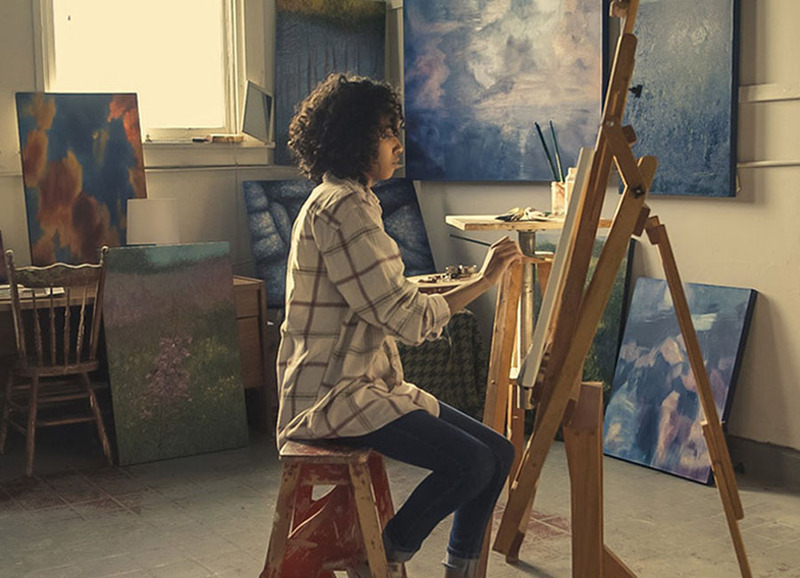 Alongside with the opportunity of showcasing your services with various galleries, you have a chance to make even a stronger impression on your visitors by implementing video content. Furthermore, social media widgets enable your impressed visitors to share your website content on different social network platforms. Thus more and more prospects will learn about your services and join the rows of your loyal clients. Possibly, you don’t want to bother your head with a large plumbing website. However, you can’t do without the online presence. 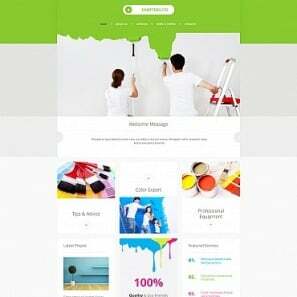 Then Plumberix Landing Page Template is your way out. The template possesses each and every feature to provide your business growth. 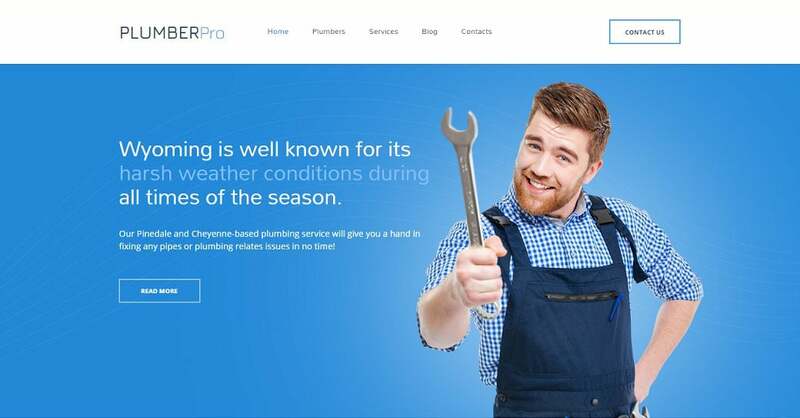 Alongside with a stunning plumbing design, you get a huge collection of widgets to add any functionality and a wide range of SEO tools to increase your rankings. To sum up, stop dreaming and start acting. 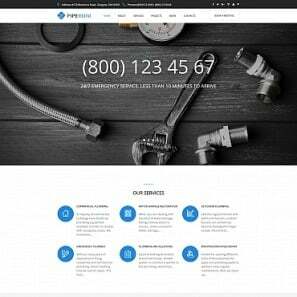 Try one of these amazing plumbing website template designs right now. Take an advantage of the free 14-day trial period and ensure that you’ve made the best possible choice. 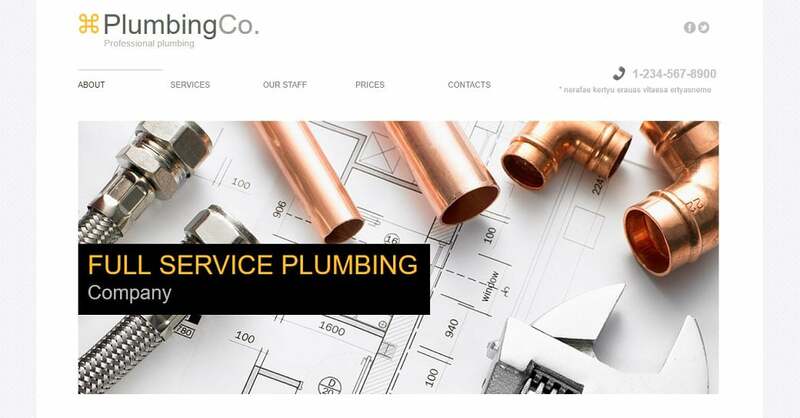 Let your plumbing website flourish on the web and bring you hundreds of loyal clients.